Ah, a humble little bowl of nibs -- ground bits of cocoa beans, where chocolate making often begins. These slightly nutty flavored, slightly sweet, earth-colored gems were also good eating by themselves. Thank you to Claire and Naomi for sharing these very lightly sweetened (with cacao blossom syrup) nibs, from Chocolate and More Munchen (Munich), Germany. I can't read German, but from looking at their website, this shop looks like a fun place to go for chocolate(s). I really enjoy cacao in this less processed, more versatile form. Nibs are good on salads and savory dishes too. 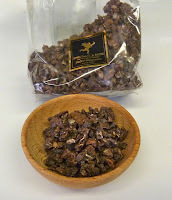 One serving of these cacao nibs kept me humming along this morning.